On 16 September 1900 Mr. Walker, Member of the Legislative Assembly of New South Wales, gave an impassioned speech to a public meeting at Windsor, calling for the establishment of a Windsor volunteer rifle corps. Citing unrest in Europe and specifically referring to Russia and France he urged that ‘Every district in the colony should be ready to take up arms for the general defence.’ In doing so he was echoing the perception throughout the 19th century of the precariousness of Australia’s position in the wider world. The Windsor Volunteer Rifles was just one of many volunteer units formed in the 19th and early 20th century. The history of volunteer rifles in the Windsor area encompassed the Hawkesbury Volunteer Rifles active in the 1860s, an earlier Windsor Volunteer Rifles /Windsor Corps in the 1870s and 1880s and the Windsor Volunteer Rifle club, active in the 1890s. as loyal hearts were to be found in their little town of Windsor as in any portion of Her Majesty’s dominions ; and if they did not come forward willingly and enrol themselves as volunteer he considered they would not only be doing injustice and discredit to themselves, but would in a manner be ignoring their British origin. One man who belonged to the Windsor Volunteer Corps in 1889 [Shut Out from the World p.66] and who may also have belonged to the later unit, the subject of Walker’s address in 1900, was Jerome Locke. He too had the British blood emphasised by Mr Walker (his Darug Aboriginal grandmother Maria was the wife of an English convict, Robert Lock) but he and his extended family were known as Aboriginal and from the inception in 1883 of the New South Wales Aborigines Protection Board lived the their lives under its shadow. Jerome Locke was not only a member of the Windsor Corps but was one of the Corps’ more accomplished marksmen. 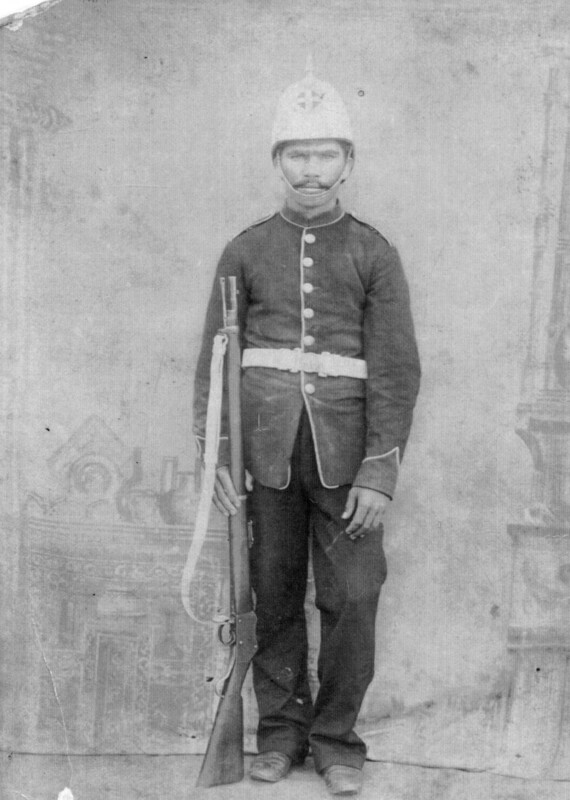 On Saturday 22 June 1889 the Windsor and Richmond Gazette reported that ‘A pleasant afternoon was spent by the Windsor Corps … competing for prizes, kindly contributed by the merchants and others of the town, for the purpose of encouraging the members of the corps in rifle practice.’ Present on this occasion was Private Jerome Locke who distinguished himself by being one of the nineteen prize winners. In joining the Windsor Corps, he became possibly the first Aboriginal man to serve in a colonial military force. But not only that, despite being over age in 1916 he also served in World War One. On 22 December 1915 Jerome Locke, by now a member of the St Marys Rifle Club, joined the Rifle Reserve Thousand recruitment march. This group mustered at Government House before proceeding to Victoria Barracks to volunteer for active service in the AIF. The Rifle Thousand was a recruitment movement inspired by Ambrose Carmichael, New South Wales Minister for Public Information, one which aimed to utilise the talent and training in state rifle clubs to augment the AIF. To this effect Carmichael conducted a letter writing campaign to newspapers all over the state and held public meetings promoting the idea of a Rifle Thousand. He emphasised that a state of emergency previously feared had now arrived and that it ‘It will now become more than a struggle between Briton and Hun. We are at present fighting for civilisation; we may have to fight for racial existence.’ This added irony to the service of Jerome Locke and was in line with the White Australia sentiment which saturated Australia. The recruits enlisted as a result of Carmichael’s recruiting drive went on to dominate the membership of the 36th Battalion AIF. This was raised at Broadmeadow Camp in Newcastle, New South Wales in February 1916. Jerome Locke’s application to enlist dated 3 January was annotated ‘Rifle Club Battalion’ and his attestation paper was completed on 6 January 1916 at Liverpool. Giving his address and place of birth as St Marys New South Wales and his occupation as contractor, he nominated his son Laurence R. Locke and later a brother John of the same address, St Marys, as his next of kin. A widower of 44 years and 5 months, he still had dark hair, his eyes were brown and his complexion dark. The Lock Family In World War One p.2. He was allocated to A Company Rifle [36th] Battalion at Broadmeadow on 24 February 1916 and left for the United Kingdom in May, serving in France and Belgium before transferring to the 53rd Battalion in early October. However his service did not run smoothly. I have to acknowledge receipt of your letter dated 1st instant… if the soldier you refer to is No. 117A Private Jerome Locke 53rdbattalion … I have to advise that he returned to Australia on 12/5/17 and was discharged from the Force in Sydney on 11/6/17 on account of being over age. A communication to the following address may reach him – Mr J Locke St Marys Cumberland NSW. The Lock Family In World War One p.5. Jerome Locke served seventeen months in the AIF – mainly overseas and was hospitalised in November 1916 with trench foot. Although forced to return to Australia in 1917, he twice attempted to enlist again in 1919, the second time with success. Despite the fact that hostilities had ended when the ceasefire was signed on 11 November 1918, it was not until the signing of the Treaty of Versailles on 28 June 1919 that there was a formal end to the war with Germany. Jerome Locke re-joined the AIF on 11 June and shortly after left for London as a member of the Traffic Control Detachment (Special Service Unit). This had the task of providing guard duties for German deportees from Australia to the United Kingdom. Jerome’s second attestation in 1919 had some differences in personal details from those he supplied in 1916. He [again] described himself as a widower but he was showing his age – his hair now described as grey – and this time he gave his place of birth as Blacktown and his date of birth as 23 August 1868. This made him almost 51 when he left Australia for England in early July and was a more realistic statement of age than that on his original application. However he was still understating his actual age by two years. ( A birth date of 1866 is given in Kohen, The Darug and Their Neighbours, p.174). Neither of his attestations refers to his service with the Windsor Corps, Volunteer Infantry although the attestation paper specifically requests details of any previous military service. However omission of this information is consistent with his attempts to disguise his real age. 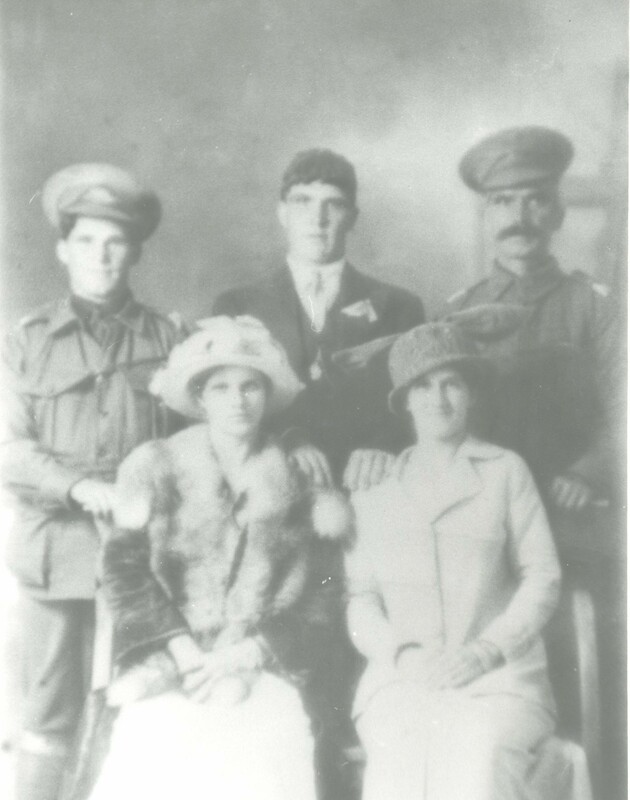 The Lock Family In World War One p.5. Jerome Locke’s acceptance and service in the Windsor Corps is an indication of his standing in the Windsor community. His total military service, considering his age and Aboriginality, was unusual if not outstanding. Noteworthy too is that in addition to his own service, at least 20 other members of the Lock and extended family volunteered for World War One. These included two of his sons Leslie John and Olga , the latter serving with him in the 36th and 53rd battalions.